This is the third part of our mini-series on how to have a beautiful wedding without breaking the bank. In this article, in an effort to give you some great tips on how to possibly save on your big day, we take a look at the dress, the Bridal party and a dress theme, as these are all, in a way, linked. Remember the key word is ‘beautiful’ – There are many ways to save on a wedding, but you still want this to be a beautiful wedding, so our advice all points in that direction. We advised you, for example, to still look into a beautiful venue instead of just having the wedding at home, because certain venues do offer really good deals and free items that can also save you money! The dress – Similar to the ring, we suggest that to save money here, you need to do some extensive shopping around, especially online, as some real bargains can be had there. Before you even do that though, as we suggested with the ring, look into what may be in the family. Once again Grandma’s dress with exquisitely fine lace may be ideal for your current ‘vintage’ wedding theme! I knew a woman marrying for the second time in her fifties who modified the wedding dress of her daughter who had married a couple of years before. It was beautiful! 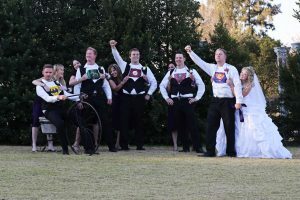 A low cost dress theme – I know of a few couples who cut costs and saved everyone else money too, by deciding to have a ‘dress theme’ wedding that involved very low cost outfits. One I attended was at a great venue in the city, but the theme was ‘beach bum’ and everyone was in their swim gear and Bermuda shorts! The decor was also just sea shells and seaweed …all cost savers and because the venue assisted to create the atmosphere nobody had to travel all the way to the coast for a real beach wedding. Another theme was a Roman ‘toga’ theme and it didn’t take much more than a few sheets and broaches to gear out the whole bridal party! Contact us to assist with many aspects of helping you to have a beautiful wedding without breaking the bank. We also have a brilliant online wedding planner e-book just to ensure you cover all the bases and the price is the best part of all …it’s absolutely free! This is, for many women at least, who have dreamed about the big day for most of their lives, the most important day they will have. The problem is, your Prince Charming is not Bill Gates or Cyril Ramaphosa and your Dad is broker than you are. It’s not uncommon and the reality is that many young couples, on a restricted budget, have to try to have a beautiful wedding without breaking the bank! In this, the first part of a mini-series that will hopefully give you some really useful tips on how to do that, we look at 3 main factors – The budget, getting ideas and the venue. Create a budget – Even if you are one of those people who have never budgeted in your life, now is a good time to start! It is absolutely essential to ascertain what you, as a couple, can comfortably afford to spend. The event you then plan needs to fall within that budget ….don’t do it the other way around ….decide on how many people you want and where etc … then figure out what it will cost. Set your amount first. Secondly, make a list of what you are going to need to pay for. Thirdly, eliminate what you can’t afford and finally (and most crucially) STICK TO THE BUDGET! Great help can be found to create and list a budget from online wedding planner resources and venues. Get ideas – Secondly, talk to friends who have been married and go online to get great ideas. Uncle Google is your best friend when planning a low budget wedding as there are many sites like Pinterest or Valverde wedding venue, where you can get low budget ideas on just about every aspect of your wedding. Here are 2 quickies just for starters – a) Ask your guests for their gift up-front in the form of money to help pay for the wedding (Don’t think it is ‘cheap,’ it leaves others who will marry after you with the option to do the same!) – b) If you find the guest list is running into hundreds, limit it to just family and very close friends. Be ruthless about this. Reducing the size of the wedding is the biggest saving. Choose a venue that will help – You will get those sites that will tell you to just marry at home or do the whole thing on a beach or something, but remember the title of this article is ‘have a beautiful wedding without breaking the bank.’ There are excellent wedding venues like Valverde Eco hotel that will give you all the elegance and beauty you need, but will help with many aspects of saving costs. These include both of the above, in that they have an excellent wedding planner which sets out a well planned budget …and they have blogs and great tips in the planner to give you plenty great ideas. Further to that they help in practical, big cost saving ways, like offering complimentary decor items so that people can do their own centre pieces etc …and talking of decor ideas, one of the most expensive wedding cost items can be the flowers. I know someone who, having been quoted thousands of Rands for flowers, bouquets and corsages, went to the fresh flower market, paid a fraction of the price for the flowers and had a small get together where everyone helped put the required pieces and arrangements together …total cost? …about R300! Watch out for part 2, where we discuss savings on the ring, the invitations and whether it is worth having a wedding planner. In the meantime you can contact us for free advice and consultation anytime … and start by using our online wedding planner e-book to plan your cost effective, but still beautiful special day! Should we have an engagement party? Is it expected? – The answer to this is a resounding ‘No.’ Remembering that not all proposals are even made with an ‘engagement’ period in mind, engagement itself is not even considered to be absolutely necessary. Your family and friends will be happy to celebrate this time with you, but should not expect an engagement party and will understand that you have bigger priorities at this time. Can we afford it? – The cost of your wedding, unless you are among the privileged few to whom money is no object, will be a major fact to consider …so do your sums before you even consider an engagement party, as it is a ‘nice to have’, rather than a ‘has to happen’. Remember there will be other parties as part of the run up to the wedding, which are considered to be traditional and more important than this one. Are we ‘jumping the gun?’ – This is a question that some couples may might find absurd and even refuse to answer. They are engaged and therefore absolutely fixed on a fairly immediate marriage to follow! That may be so, but you may also be one of those couples that see engagement as a fairly long term, ‘trial period’ of cementing your relationship before an absolutely final decision of when to be married is made. If you are the latter, possibly having an engagement party is premature? It’s your call. If we go ahead, do we invite everyone that will be at the wedding? – If you do, you will be the exception. Very few people can afford to have a very large engagement party, but that aside, an engagement party is usually an occasion just shared with immediate family and very close friends. It can be a small, cosy and far less costly affair. It’s not a bad idea to look for a versatile wedding venue that can accommodate an intimate party, as well as the main event, so you can get a feel for the place before the big day. We hope that question “Should we have an engagement party?” has been answered for you with these questions, but always keep in mind that the only thing that is ‘set in stone’ about any wedding is that the Bride and Groom show up on the day and have the kind of wedding that they want to enjoy. Pretty much anything else is up to you, so go with your heart ….and your wallet! Nothing can quite match that moment when your partner proposes to you! Your heart leaps and soars and your mind thrills to be loved by the person you love and who wants to spend the rest of their life with you. Sadly, when you announce to the world your happy news, you might find that not everyone is as equally thrilled. Not matter what their reason may be; a gracious bride should be as understanding as possible of her friends’ and family feelings – but only up to a point. If it is one of your girlfriends, they may be fighting the green monster of jealousy, especially if they are still single and want to be married; or if they are already married but unhappy in their partnership. If your friends aren’t being rude about it to you, you might want to consider tackling the fine line between talking about your wedding and not rubbing it in your friend’s face. If you friends happen to be a little possessive over their time with you and fear that they are now going to lose you altogether because you are married, you will need to make it clear that you will always need your girlfriends and that you would love their help in planning the wedding. Make a point however, not to overwhelm your girlfriends with wedding details and wedding talk and be able and willing to talk about other things, listen and genuinely care about what is going on in your friends’ lives too. You have heard the saying ‘choose your battles’ and in some instances the best response to personal comments about your impending marriage is to simply ignore them. If a friend or a family member does overstep the mark and becomes obnoxious, you will need to handle it immediately. You may want to ask them in a direct and unemotional way why they are being so negative. Chances are they will back off when confronted. Alternatively they may be able to voice their fears; in which case further discussion and understanding on both your parts can allay the situation completely. In extreme cases, it may be necessary for you to cut ties with the person altogether, especially if they show no signs of being able to contribute towards your happiness or the success of the day. Weddings can be stressful enough without someone always trying to undermine you and sabotage your happiness. Learn to read the signs and establish your boundaries as to what is acceptable and unacceptable behaviour. Also consider that in any situation, it is always a 50/50 balance of responsibility for our words and actions and this may be a good opportunity to also take a step back and look at your own behaviour. Are you perhaps being a Bridezilla and taking your attention-seeking behaviours to an unbearable point by always monopolising the conversation with your wedding plans, insisting friends throw lavish showers or pay for expensive wedding events. While your wedding may be the most important thing to happen to you, it can be annoying when you lose sight of your friend’s lives through selfish thinking and self-obsessed behaviour. Your friend’s are your friends for a good reason and both of you need to do your upmost best not to let your wedding event cut the ties that have served you both up until now. 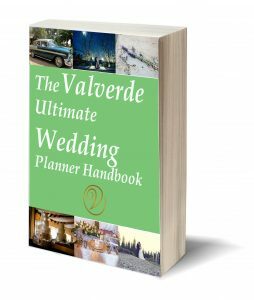 For more guidance on how to navigate the emotional complexity of planning a wedding click here to download our Ultimate Wedding Planner for FREE.